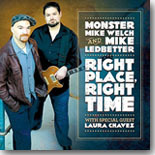 Guitarist extraordinaire Monster Mike Welch teams up with singer Mike Ledbetter for the awesome Right Place Right Time --- it's this month's Pick Hit. The Queen of the Blues in Detroit is Thornetta Davis, but after her new CD, Honest Woman, she may become famous outside Motown. An easy pick as our Surprise CD of the month. Our Flashback feature looks back at a classic Son Seals album, Bad Axe, from 1984. It brings back many fine memories of one of the best Chicago artists ever. Our What's New section features new CDs from John Primer and Bob Corritore, John Mayall, Scott Ramminger, Coco Montoya, Elvin Bishop, Bobby Messano, Tas Cru, Michael Hornbuckle, Lisa Biales, and more.